The limited edition 3DS XL is no longer only for Europe. It's apparently never too early to start preparing for Black Friday as a GameStop Black Friday advertisement was leaked. The advertisement shows several sales on games, promotions for that Friday, and a Legend of Zelda: A Link Between Worlds 3DS XL. Nintendo announced earlier the limited edition 3DS would be available in November for Europe but had said nothing about the US. GameStop has confirmed that this ad is legitimate, according to Polygon. GameStop is not aware how the advertisement leaked. The bundle includes a download of A Link Between Worlds, and it costs $219.99. As the game is scheduled for a Nov. 22 release, as is the limited edition 3DS will release in Europe, the Zelda 3DS XL will likely come out the same day in the US. 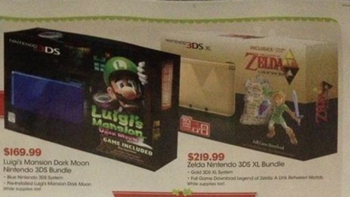 The ad also shows a Luigi's Mansion bundle, including a blue 3DS and Luigi's Mansion: Dark Moon for $169.99. Trading in a 3DS reduces the price to $94.99 while trading in a 3DS XL reduces it to $69.99. There are several other deals as well, so checking out each page of the advertisement on BFAds may be worth your time if you're willing to get out of bed in the middle of the night to stand in long lines for the right deals.